iddu, an Indian-born producer living in London, was looking for a singer to record a tune by Brooklyn songwriter Larry Weiss (also the composer of Glen Campbell's 1975 number one smash "Rhinestone Cowboy") in the spring of 1974. Two years earlier, Biddu had composed the music for the film Embassy starring Richard ( Shaft ) Roundtree and through friends had met Jamaican singer Carl Douglas, whom he hired to sing the title song. Thinking that Douglas might be right for Weiss' "I Want to Give You My Everything," Biddu gave him a call. The Weiss song was intended for the "A" side of a single, and Biddu needed something to record for the "B" side. "I asked Carl if he had any lyrics," Biddu recalls. "He rattled off about four or five songs that he had written... one of the songs... had the lyrics for 'Kung Fu Fighting.' Since it was going to be a 'B' side, I said, 'Fine, we'll have a song called 'Kung Fu Fighting.' So I started working out some melody for it. Nothing was taken seriously." 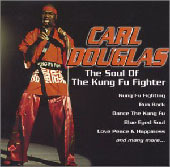 Carl Douglas' irreverently titled 1974 LP Kung Fu Fighting and Other Great Love Songs peaked at #37 on the Billboard Hot 200 and spent a total of 17 weeks on the charts. In Oct. 2002, Sanctuary/Castle Records released the Douglas compilation Soul of the Kung Fu Fighter (above) on compact disc. With only 10 minutes of studio time left, "Kung Fu Fighting" was recorded quickly. "We did a lot of 'hoos!' and 'haas!' like someone giving somebody a karate chop," Biddu explains. He presented the Weiss song to Pye Records' A&R chief, who liked it, but wanted to hear the flip side as well. "It's just a fun thing," Biddu warned, but the label didn't laugh. They thought it was good enough to release as an "A" side. Biddu responded, "If you really think so, although I think it's the kind of song that might sell 20,000 records." The record company thought it would do better than that. Karate was fashionable in the '70s, but kung fu was even bigger -- Bruce Lee had popularized the ancient martial art at the box office. So Pye released the single in Britain and waited for the results. "The first five weeks, we didn't get one play on radio," Biddu recollects. "It didn't sell one copy. And then suddenly, it just took off from the (dance) clubs and it went to number one. It went to number one all around the world. We sold nine million copies." "Kung Fu Fighting" was picked up for American release by 20th Century Records. The week that it yielded the number one position in Britain to John Denver's "Annie's Song," it entered the Billboard chart at number 94. Eight weeks later it had battled its way to the top of the magazine's Hot 100 pop chart. Douglas, a former engineering student, only managed one follow-up in America, the similarly-constructed "Dance the Kung Fu," number 48 in March, 1975. He continued to have hits in England, where "Run Back" made the Top 30 in 1977. Biddu released several instrumental disco albums and produced another British number one hit, "I Love to Love (But My Baby Loves to Dance)" by Tina Charles. He returned home to India to compose music for films as well as recordings. Now living in London once more, he reflected on the international success of "Kung Fu Fighting." "If I had a theory why the record was a hit, I'd have more hits! You never know whey a record is a hit. It had street appeal, I think. It was a bit of a novelty, but... it was a hit all over the world. Maybe it was just a good pop record without us knowing about it." Martial arts such karate and kung fu are still incredibly popular today. Just about every city and town has a school offering some type of martial arts training. While training, some kung fu students wear colored wristbands to emulate the traditional black and white belt, while others get decked out in Shaolin Monk training uniforms and studded wristbands.